"Another of my favourites is the Port Jackson fig, Ficus rubiginosa. It has larger leaves making small or medium-sized trees a problem, but it is a superior material for larger trees. In containers it is a strong grower, its leaves reduce well, and it develops splendid aerial root formations. In fact. it will form aerial roots the most easily of any figs that I have used" (Meislik. 2004). My experience is of growing the Port Jackson fig outdoors, well removed from its natural range, yet it stills performs admirably as bonsai material. My tree has been grown as a bonsai subject for 18 years, after being started from a nursery purchased tubestock. The tree's current canopy dimensions are approximately 600 mm high x 800 mm wide. Figure 1: Damage to the foliage of a Port Jackson Fig caused by exposure to cold temperature. Living on the boundary of two of New South Wales' climatic districts, the Riverina and South West Slopes, I experience a warm temperate climate. Average annual rainfall is around 574 mm, winters are relatively mild although frosts are common (50 per year) with an extreme cold of around -7oC possible, though -3 or -4 is more likely. Summers are warm to hot with an average of 19 days per year greater than 35oC. However, this most recent summer (2005-2006) recorded 32 days greater than 35oC (with 6 days greater than 40oC). Figs, the majority of which are tropical or sub-tropical trees, are often mentioned in bonsai books as suitable for cultivation as indoor bonsai. 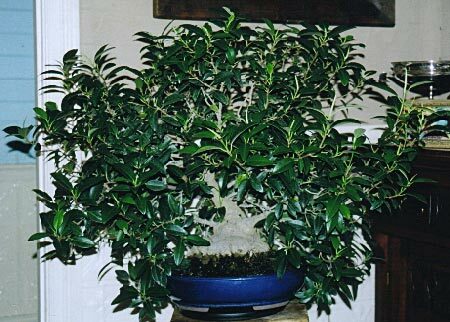 The intent of my article is to outline cultural and styling techniques used tor the Port Jackson fig bonsai in a warm temperate climate, and to (sometimes) correct or contradict advice offered in such books regarding the species cultivation as a bonsai. Over its life as a bonsai specimen and in the course of my development/experimentation as a bonsai technician, the tree has been subject to varying regimes of care. I will outline those I consider most successful for the Port Jackson fig in this climate. As with any containerized plant, the tree needs to be moved around the garden throughout the year to achieve the preferred exposure. Port Jackson figs enjoy good light conditions, which assist in keeping foliage dense and leaf-size small. During warmer months (October to March) the tree does best with about 7 hours of direct sun. Due to the heat of summer temperatures experienced, this needs to be morning to early afternoon sun, so the tree is sited where it is in shade from around 2pm. In the winter months the tree is shifted to a north facing verandah, where it receives approximately 5 hours (8.30am to 2.30pm) of direct sun. The verandah cover is also necessary to protect the tree from winter night temperatures. Although most books (including Meislik's) suggest 10-12oC as a minimum the species (and figs generally) can tolerate, the air temperature on this verandah would often he in the order of -2 to 0oC without injuring the tree. One winter, due to oversight, the tree was left 'out' (from overhead cover) until late June, and although badly cold damaged (see Figure 1), it survived the ordeal. The foliage turned red, then brown, before falling. Most branches and twigs were thankfully undamaged and re-budded. The species enjoys ample water and, from my experience, it is difficult to "overwater" the Port Jackson fig. I prefer "immersion' watering, where the whole pot is submerged in a vessel of water until the resultant bubbles stop. This may be daily in the warmest months, tapering to about once every 10 - 14 days in the middle of winter. A daily (or even morning and evening) 'misting' of the tree in warmer conditions helps to compensate for the 'dry air' of the warm temperate climate. Figure 2 - Port Jackson Fig photographed in August 2006 after complete defoliation in the preceding February. This dry summer air also precludes the development of the 'splendid aerial root formations' that Meislik refers to. I use a half strength (balanced) liquid fertiliser fortnightly in the warmer months, extending the interval at either end of spring and autumn, and not fertilising at all April to August. If the fertiliser regime (or the potting mix) is too rich the tree will respond with luxuriant growth, characterised by (undesirable) larger leaves. 'figs pruned in frost temperatures and in extreme heat (temperature over 40oC suffer no ill-effects whatever (provided that after-care is adequate)'. However the 'preferred' timing of root-pruning would be November in this climate. Port Jackson fig can be styled to most bonsai styles and is very amenable to pruning. 'Styling' is best undertaken mid October to mid December. Trimming (or 'pinching') the tree's foliage is very important to its presentation as a bonsai, as it limits leaf size and encourages 'back budding'. Figure 3 - Port Jackson Fig in January alter a period of uninhibited growth, prior to trimming and shaping. The tips of shoots should be regularly 'pinched' throughout October to March, limiting the shoot to a maximum of 3-4 leaves. The species also tolerates complete defoliation, a technique which reduces leaf size and encourages 'back budding'. This is best undertaken mid to late summer. I have done it as late as mid February, with the tree regenerating foliage within eight weeks (see Figure 2). Any pruning will result in a milky sap from the cuts. Some books suggest that pruning should only he undertaken in winter. 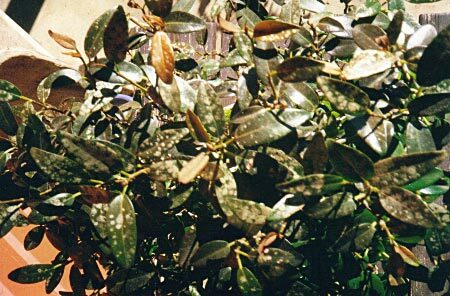 However, the milky sap is easily controlled by spraying with water (Koreshoff, 1983). 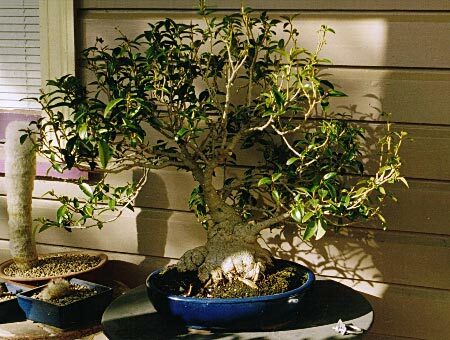 A final point on the cultivation of the Port Jackson fig as a bonsai subject is equally applicable to most species being trained and grown as bonsai. The tree is a growing organism which responds to the rhythm of daily and seasonal change. Keeping it in immaculate, trimmed, show condition on a permanent basis is not good for its health. Allow the tree to grow untrimmed for extended periods before 'shaping' back to the ideal (see Figure 3). This allows the tree to store energy during the period of unrestrained growth. Continually keeping it in 'show condition' can result in a weak tree. Koreshoff, D. & V., 1983. Bonsai with Australian native plants. Boolarong Publications, Brisbane. Meislik, J., 2004. Ficus: The exotic bonsai. Devonshire Gardens, Whitefish, Montana. Webber, L., 1991. From rainforest to bonsai. Simon & Schuster, East Roseville. From the newsletter of the Australian Plants as Bonsai Study Group, December 2006.